I’ll admit I’m unfairly targeting Vista, but in this day and age, there’s no excuse for this sort of error message and its mumbly-crumbly error text (“might be useful if…”). Might be useful if Error 0x8000FFFF meant anything to the operator. 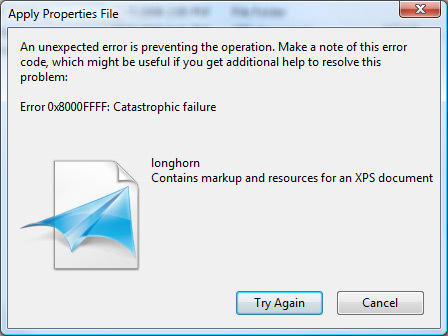 Riddle me this: is there a real need to tell the user that the error was unexpected? Is there a table of expected errors somewhere? Some errata exspecto? And then, to make matters worse, the PC Magazine author who captured this screen shot noted that the error “turned out not to be catastrophic at all.” In a nutshell, the error message contains an error itself. This entry was posted in Front Page, Humor, Technology by Chris Brewer. Bookmark the permalink.